Based on the great men and women you know who have fought for our freedom, and based on what you’ve learned about Mark and many others from this web site, how do you Honor the Heroes? We have the mantle on us to honor them by how we live. From the moment Mark was killed on 29 September 2010, we have witnessed tremendous acts of Patriotism in various ways. The Patriot Guard Riders came to town for at least three days. They escorted Mark’s body from the Haleyville airport to the funeral home. From the funeral home to the school for the funeral, and from the school to the cemetery. They also stood guard outside the funeral home for the viewing, and the school for the funeral. This was all with the purpose to protect the family from any unwanted protesters. I’m pretty sure I was the last person to leave the funeral home the night of the viewing on 6 October, and they were outside the door waiting until the last family member left. Also there were members of the city’s police, fire, and rescue squads. People stood along the streets with flags and hands over hearts as Mark’s body was escorted from the airport, then to the school, then to the cemetery. Businesses shut down, the city offices shut down early, the schools closed early. I was told there wasn’t an American flag to be found in all Winston county, and much of Franklin and Marion counties. We’ve received many letters and cards from various individuals and groups, including the group “Soldiers Angels”. 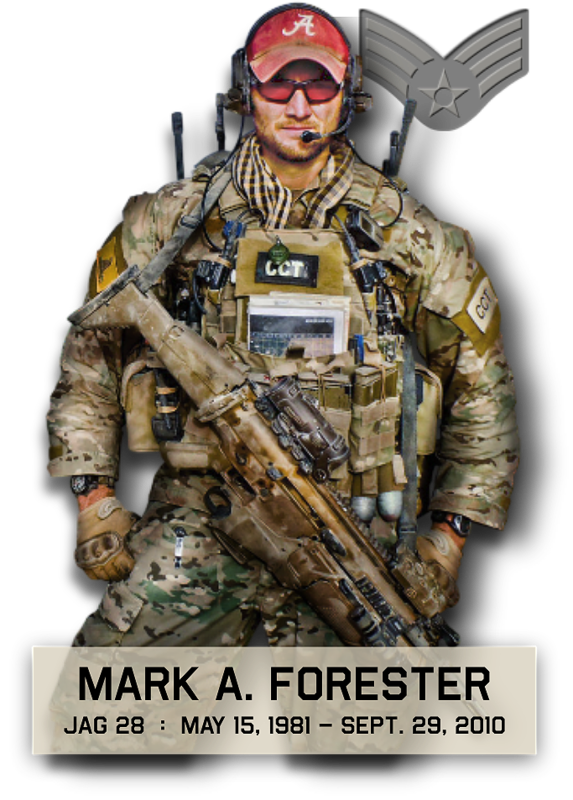 Donations were made in Mark’s name to The Special Operations Warrior Foundation, and now donations are being made to The Mark Forester Foundation. Please take the time to comment what you have done, what you do, are what you will do to Honor the Heroes. If you haven’t felt impressed in the past, think about this request and start now to find ways to honor them. It can be something as simple as flying an American flag at home or business, thanking a veteran, welcoming home service members from deployments, seeing them off as they deploy, etc. There is a great HBO movie with Kevin Bacon called “Taking Chance” that is worth watching. It shows the respect and Patriotism our citizens have for the fallen in uniform. We look forward to seeing your comments below. Remember, when we honor one, we honor them all. How do you Honor the Heroes?